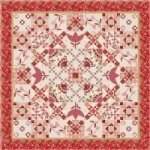 Sew In Love is an 11 month block of the month for a quilt that measures 75.5" x 75.5". Book is sold separately. McKenna Ryan's: 12 Months of Happy!